Choose your size and bore for each pulley. Call 574-267-7522 for order assistance and to check our warehose stock. Our online inventory only shows select sizes at this time. We stock MANY sizes at our store locations. Click the section for your Brand to view our online selection. Then find the "Diameter" you need and choosing the Bore size you need under the drop-down menu. ADD TO CART when ready to order. 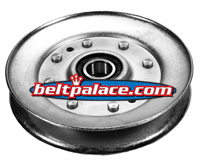 Click "LIST ALL" to see all our idler pulleys available for online purchase. • Click HERE to list all the idler pulleys for lawn mowers currently on our website. View our online selection of John Deere compatible idler pulleys for lawn mowers. Professional quality OEM replacement idler pulleys. View our online selection of Snapper-Simplicity-Lawn Boy-Toro compatible idler pulleys for lawn mowers. Professional quality OEM replacement idler pulleys. 100% Secure Shopping!